Uniformed members of public safety agencies attended the Mass at the Cathedral for Immaculate Conception in Portland Sunday. 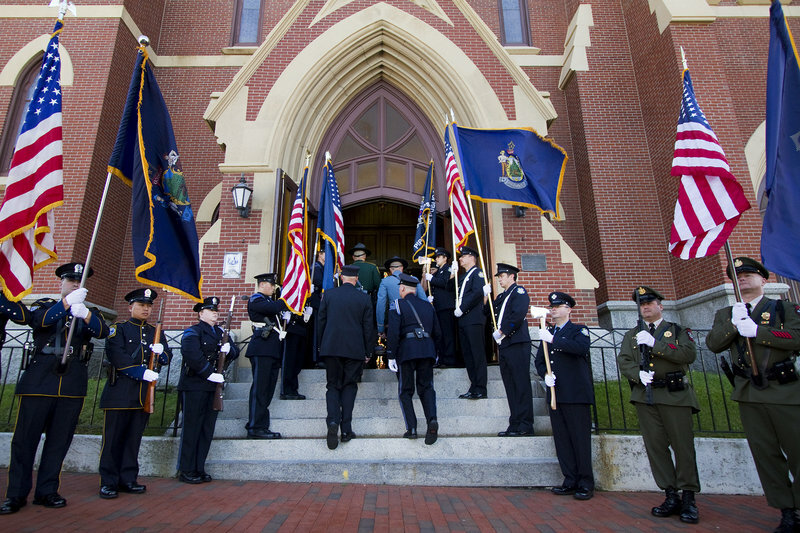 PORTLAND — Maine’s Catholic diocese paid tribute to police, firefighters and paramedics during the church’s annual “Blue Mass” Sunday. Public safety personnel enter the church for the Blue Mass, which takes place in Portland each year on the weekend closest to Sept. 11 to recognize the response to the 2001 terrorist attacks. 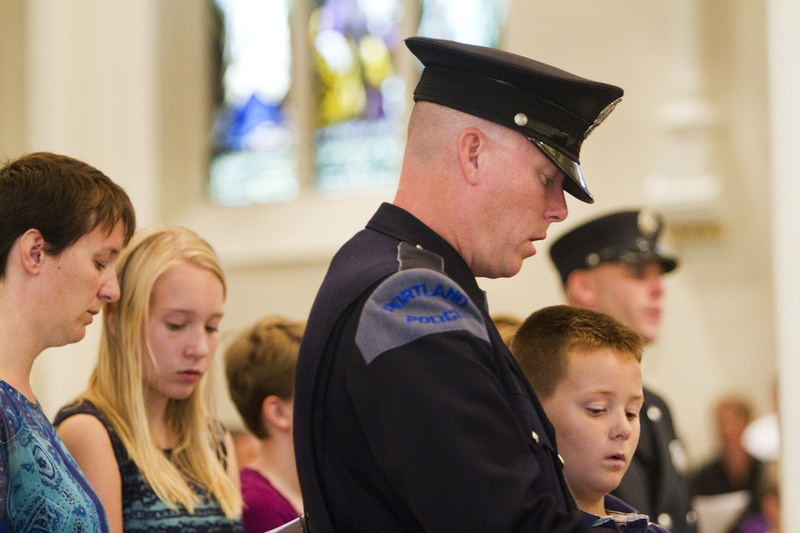 Portland Police Officer Kevin Haley and his son William, 9, participate in the Blue Mass at the Cathedral of the Immaculate Conception in Portland on Sunday. Hundreds of local, state and federal law enforcement officers, firefighters and emergency personnel were recognized for their dedication and self-sacrifice at the annual Mass. Portland Fire Department Deputy Chief William Flynn, from left, Chief Jerome LaMoria, Capt. John Cannon and Capt. Keith Gautreau attend the Blue Mass on Sunday. 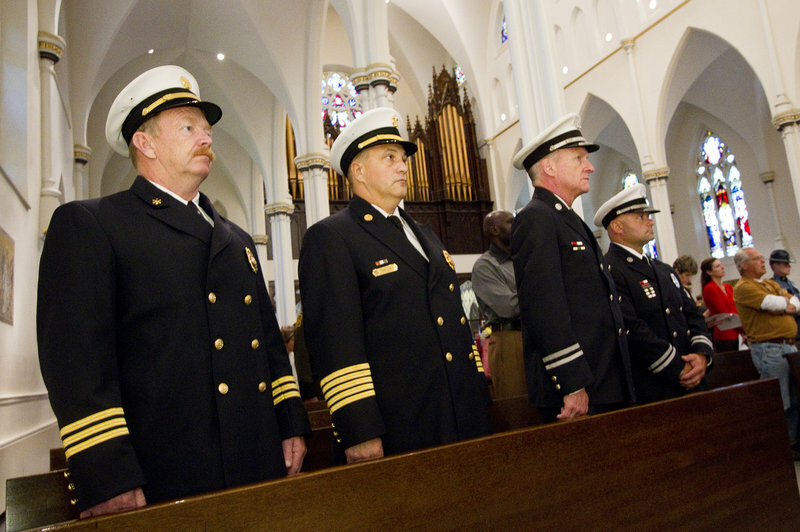 Monsignor Marc Caron gave thanks and bestowed his blessings on Maine’s emergency responders during Sunday services at the Cathedral for the Immaculate Conception in Portland. Members of public safety agencies attended the Mass in uniform. 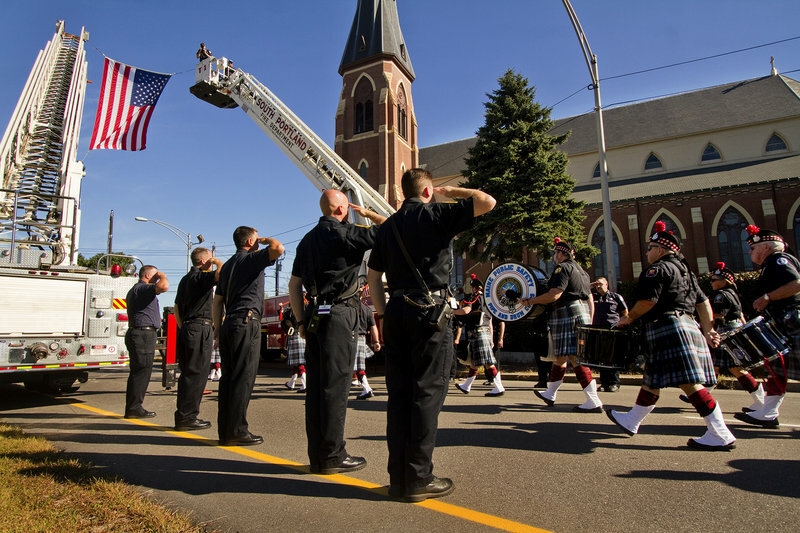 Color guards were on hand and the Maine Public Safety Pipe and Drum Corps performed outside the church before and after the Mass. The event takes place each year on the weekend closest to Sept. 11 in recognition of the response to the terrorist attacks 11 years ago.